According to the World Bank, the past four years have seen tepid economic growth, with global GDP growing at under 3% annually. While 2.5% growth is far better than the rate of -2.1% that was seen at the low point of the 2009 recession, it doesn’t begin to meet the rates of over 4% that was seen during the mid 1990s and 2000s. Economists have been saying for some time that we are looking at the new economic “normal”. But does that have to be the last word? Few weeks ago I traveled to São Paulo, Brazil and Ankara, Turkey where I had the opportunity to represent WIPP and WIPP International and our members in critical discussions about global economic development. At both events, leaders from governments, NGOs and the business world took the stage to reiterate the need for gender inclusive growth policies. 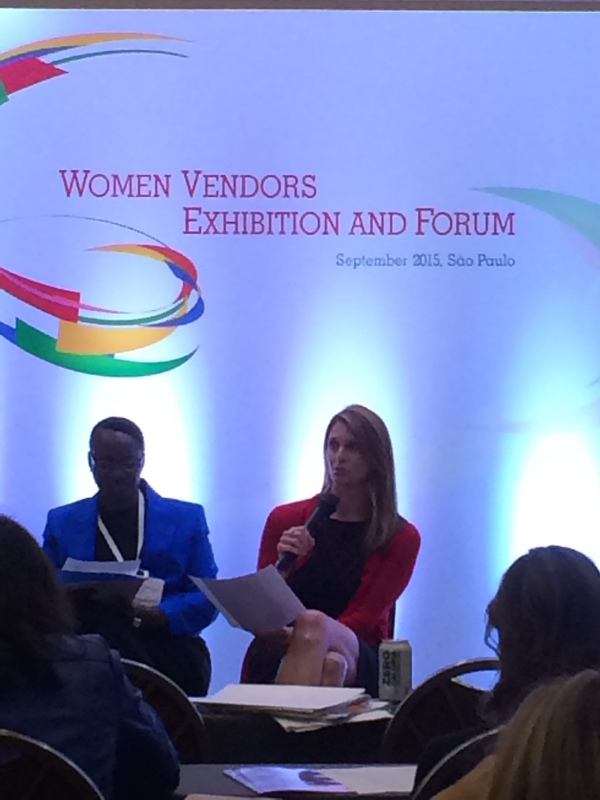 In São Paulo, the International Trade Center’s (ITC) Women and Trade Programme hosted the annual Women Vendors Exhibition and Forum (WVEF), which seeks to increase the participation of women owned businesses in global supply chains. According to the ITC, women globally own almost 10 million small and medium-sized enterprises (SMEs) which account for almost 80% of jobs around the world. It is well known that supporting an environment that encourages entrepreneurship spurs job growth. At the event, ITC Executive Director Arancha González called on world leaders, governments, and the business community to develop economic and procurement policies that will create one million more women entrepreneurs by 2020. The call to action will impact local and global markets by stimulating job creation at record levels. In Ankara, the G20 launched the Women-20 (W20), an engagement group focused on promoting gender-inclusive economic growth. The group’s mandate is to advance recent G20 commitments on: women’s full economic and social participation (Los Cabos Leaders’ Declaration, 2012); women’s financial inclusion and education (St Petersburg Leaders’ Declaration, 2013); and gap reduction in participation rates between men and women in G20 countries by 25 percent by 2025, taking into account national circumstances (Brisbane Leaders’ Declaration, 2014). Turkish Prime Minister Ahmet Davutoğlu made an impassioned speech about the potential of the W20 to positively impact the global economy. Today, in the G20, male economic participation is 86%, but only 56% for women. He added that for every 1% rise in female participation, it is estimated the global economy will grow an additional $80 billion and a 10% rise would increase the global GDP by an amount equivalent to Turkey’s annual GDP today. International Monetary Fund (IMF) Managing Director Christine Lagarde highlighted that data compiled by the World Bank indicates 90% of countries still have laws that discriminate against women. She admitted that the IMF in the past has not had a strong focus on women, but the impact to women and the potential of women in the economy is now considered in every IMF country visit. She added that words are important, but to echo Prime Minister Davutoğlu, it is what gets implemented and the outcomes that are achieved, which really matter. The important takeaway from these meetings is not that gender inclusive growth policies are the moral or right thing to do, but that they are the smart economic thing to do. Increasing women’s participation in the global economy has the potential to add to the global GDP the economic equivalent of a new China or India. In a time when no one is quite happy with the “new normal” economy, isn’t this the smart thing to do for everyone, both men and women? This entry was posted in Economy, Leadership, Women Entrepreneurship, Women in Leadership and tagged business growth, business trends, G20, W20, Women 20, Women empowerement, women entrepreneurs, Women in business, Women Vendors Exhibition and Forum by WIPP. Bookmark the permalink.